The Empire State Plaza and its history are getting a lot of attention this summer because it's the 50th anniversary of the official cornerstone being laid for the ESP (the exact anniversary was this past Sunday). And even in non-round number years, the ESP gets a lot of attention in discussions about the history, architecture, and planning of downtown Albany. Because of course. But here's something new to us -- Albany Archives pointed it out to us this week -- so maybe it will be to you, too: There was was a proposed plan for the state to remake the area near the Capitol in Albany that pre-dated the ESP -- by more than 50 years. And the plan helps add some context for how things actually did turn out. 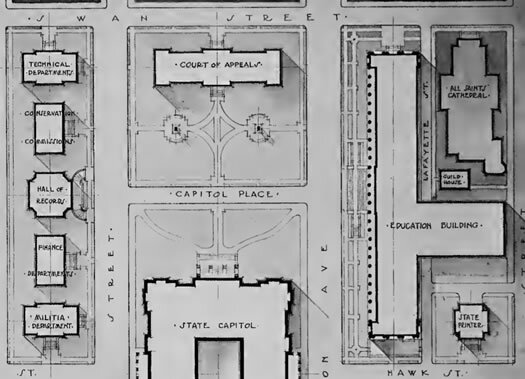 In short: In 1911 state architect Franklin B. Ware proposed building a campus-like collection of buildings around the state Capitol in Albany in order to house the state's various (and growing) offices and agencies. One of the significant items in the plan was a new building for the Court of Appeals where West Capitol Park is today. As heretofore mentioned, the desirability of placing all the departments under one roof is questionable. Of whatever fireproof material the building may be constructed, furniture and fittings, to say nothing of papers, records, etc., are inflammable and cannot be made otherwise; and, when a fire occurs in such material, the heat created is so intense that the best of fireproof material gives away. If, therefore, the departments or groups of departments were housed in separate buildings, damage by fire or water in one will not cause damage to others. Had there been a strong westerly wind on the night of the fire, no substantial portion of the Capitol would have escaped damage, in which event all the departments which were located in the Capitol would have suffered serious loss and all business wf the State would have been at a standstill. In other words, he's basically pointing out that no single building is disaster proof. So it makes sense to spread things out. Ware notes that reconstruction of the Capitol would allow for needed space for legislative operations. And what about other departments that had been using the Capitol? As a matter of fact, every department originally housed in the Capitol has demanded additional space for some years. In some of the departments the conditions, are such, that it is impossible to carry on public work in a proper manner. He goes on to describe how the problem had been addressed to that point -- basically stuffing people in wherever they could using "mezzanine floors of non-fireproof construction" that also cut off light and air. Ware mentions the possibility of just making the Capitol larger by extending it to the west. But: "[The Capitol's] architecture has been criticised by many experts and any extension to the west will provide additional cause for criticism." Also: He pointed out that building on what's now West Capitol Park would block the view of the State Education Building (and all those beautiful columns). A decade later, the space issue persisted. A New York Times article in 1921 noted "the Capitol is overcrowded." The Ware plan didn't include a skyscraper. The plan to build the Alfred E. Smith Building wouldn't get the official go-ahead for another 15 years (and it wouldn't be renamed the Smith building for another two decades after that). But reading through the plan -- and knowing how events turned out -- you can see how things were starting to lineup for the art deco skyscraper. Both the need -- the Capitol was overcrowded and state offices were spread about the city -- and the actual location. 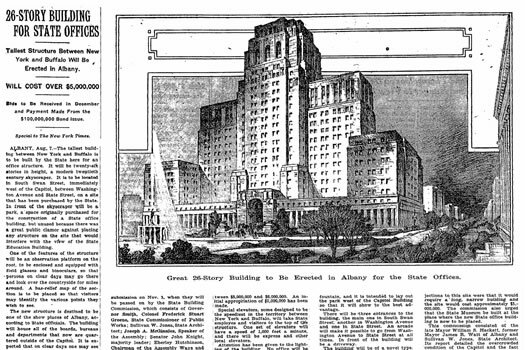 A 1926 NYT article notes that the Smith building was originally planned for what's now West Capitol Park, but -- paging Franklin Ware -- "there was a great public clamor against placing any structure on the site that would interfere with the view of the State Education Building." By the way: The original name of the Smith Building was... the State Office Building. Also: There was an apartment building on the Swan Street site needed for the skyscraper. So it was moved -- literally. The whole building was picked up and moved. A lot of this is just kind of Albany history trivia. But we've been thinking about alternate histories lately, and the Empire State Plaza is a natural subject for that. 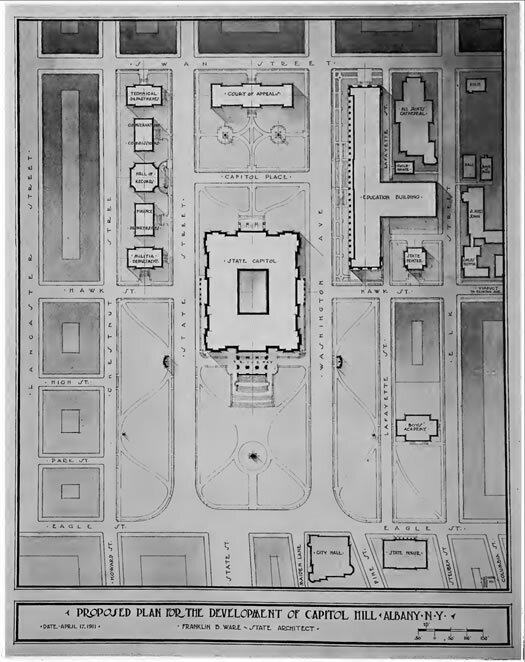 So, this reading through this pre-ESP plan got us thinking again about what might have happened if the plaza hadn't been built -- and whether the state would have left that section of the city near the Capitol untouched. Maybe it would have. But it also doesn't seem improbable that the state and its operations -- hungry for office space and room -- would have eventually expanded into that area in some way, changing it significantly. It's a pretty solid design and it would've been nice to see Ware's plan come to fruition. In the end something similar to the Empire State Plaza probably would've still happened and it probably would've been just as big. In fact, who's to say Rockefeller wouldn't have knocked down those five outposts on State St to build the LOB. It's a nice thought he wouldn't have, butâ€¦..